The battle of Kursk began on the afternoon of July 4, 1943 with a dive-bombing attack by a squadron of Stukas around Butovo in the Kursk salient. Although the German offensive was called off on July 17th, when Hitler directed the withdrawal of II SS Panzer Corps, the fighting in the salient did not end on that day. It would continue until July 23rd, when the Russians had re-taken the ground lost to Fourth Panzer Army during the battle and had pushed it back to its starting point. In the fighting around the village of Prokhorovka on July 12th, history would witness one of the few duels between two tank armies. The 850 tanks of the Soviet Fifth Guards Tank Army, mostly T-34s, usually at a disadvantage against the 88mm guns of the Tiger at long range, managed to close with the German armor and maneuver inside the German formations. The T-34s had managed to stop the advance of II SS Panzer Corps. While Prokhorovka helped to turn the battle of Kursk into an epic tank battle, German tank losses at the village may have been only around twenty-five or thirty. The heaviest losses had occurred in the first six days. The Soviet ability to withstand the German attack was unwelcome news. The Red Army's ability to mount an offensive action in the immediate aftermath of the battle came as an unexpected surprise. The Soviets launched a counter-attack at 5:00 in the morning on August 3rd with an artillery barrage. By 2:00 in the afternoon they had broken through the main German defenses. Belgorod was re-captured after heavy fighting on August 5th. On August 22nd Manstein ordered the German evacuation of Kharkov and on August 23rd the Red Army took the city. The German army retreated, in hopes of stopping the Soviet advance with a defensive line at the Dneiper River. On September 26th, the Soviets secured two small bridgeheads on the western side of the river. On November 6th, they captured Kiev. The Ostheer, the German Army in the East, by mid-September 1943, had retreated some 150 miles, along a front 650 miles wide, from the line held at the beginning of July. German 'irreplaceable' losses (dead, missing, and one-third of the wounded) at Kursk and during the retreat to the Kneiper, from July through October, were 350,000, higher than at Stalingrad, where 209,000 (twenty divisions) had been lost. (Soviet figures for Stalingrad counted 147,000 German dead and 91,000 taken prisoner.) Russian sources placed the number of German officers and men killed at Kursk itself at 70,000, with 2,952 tanks and 195 assault guns destroyed. (The combined losses for the Italian, Hungarian, and Romanian allies fighting with the Germans at Stalingrad had been 450,000.) The Russians may have suffered 1.1 million casualties in the Stalingrad campaign, of which 485,751 were fatalities. Hitler, in invading Russia, had ignored the central lesson of Napoleon's 1812 campaign, some 130 years before. As winter set in in 1941, he convinced himself that Napoleon's mistake had not been the decision to invade, but the decision to retreat from Moscow, once in French hands. If the German army could somehow hold its ground during the winter of 1941-42, the major mistake of the French campaign would not be repeated. When it managed to survive in Russia he remarked: 'We mastered a destiny which broke another man 130 years ago.' Napoleon's decision to retreat from Moscow was one of the few realistic decisions he had made. He had vastly underestimated the military resources needed to conquer Russia and he had miscalculated the fighting abilities of his Russian opponents. He believed that all he needed to defeat Czar Alexander was a decisive battle or, at most, the capture of Moscow. He also considered his army too large to be swallowed up by the territorial expanse of the lands he intended to conquer. When Napoleon began his invasion in June 1812, he had an army of 449,000 men, which took three days to make the crossing of the Niemen River (June 24th-26th). His main French army group had numbered 286,000. When it left Vitebsk it had been reduced to 191,500. On August 23rd, at Smolensk, it had fallen to 161,475. When it departed Smolensk its numbers had dwindled further, to 149,075. By September 2nd, a week later, it had lost another 15,256. When it arrived before Borodino, some seventy miles west of Moscow, at the beginning of September, the number was down to 133,819. At Borodino Napoleon had an effective force of around 124,000 men, with 587 guns. The Russian army which opposed the French at the Niemen crossing had numbered 183,000 men, supplemented by 15,000 Cossack fighters. At Borodino, General Mikhail Hilarionovich Kutuzov, Russian commander in chief, had a force reduced to 103,000 men, with 637 guns, with another 7,000 men among the Cossack forces. While the Russians had more and heavier guns (a broadside weight advantage of 4,800 pounds to 3,800 pounds), the guns would be positioned in the lines of the First Army where most would not come into play during the battle. On September 5th, the Russian army was driven off from a redoubt it had constructed at the village of Shevardino, south of Borodino. Deciding that Borodino offered the best opportunity to confront Napoleon, the Russians began constructing two sets of redoubts. The "great redoubt" or "Rayevsky's (Raievsky's) redoubt" was constructed near the center of the Russian line, not far from Borodino. Close to the village of Utiza they constructed three more redoubts, known as "Bagration's redoubts." Napoleon planned two attacks for September 7th. The main attack was to go against the three Bagration redoubts, with a diversionary attack against Borodino intended to mask the main assault. Around 6:00 in the morning, with a haze covering the ground, a cannon from General Sorbier's Imperial Guard artillery fired a signal shot. When the fog began to lift he had to move his guns up. He realized that they had been wheeled into position further back than intended. The fog afforded the French an advantage in the Borodino attack, since Prince Eugène de Beauharnais' divisions were not detected until they emerged from the mist. The Russian Jaegers defending the village were taken by surprise. They retreated across the wooden bridge spanning the Kolotcha (Kolotsha) River and up the hill toward the village of Gorky. The French fusiliers of the 106th Line Regiment, without any order, began following the retreating Jaegers. General Mikhail Barclay de Tolly, Russian commander of the First Army of the West, ordered a colonel to take two Jaeger regiments and counterattack. They advanced down the hill until they were within thirty yards of the French forces, then fired a volley and followed it up with a bayonet charge. The attack decimated the 106th and pushed it back into the Kolotcha. The French general Plauzonne was killed in the musket volley. The 300 French guns on the southern side of the battlefield began their bombardment shortly after six in the morning. The 57th Regiment, nicknamed "le Terrible," under General Dominique Compans was to make an assault on the southernmost Bagration redoubt. To reach the redoubt they had to descend into the dry gully of the Kamenka streambed, ascend the other side, and then cross open ground before reaching the redoubt. Even as they began crossing the open ground, Russian cannonball and grapeshot began ripping apart their formations. General Compans himself received three grapeshot slugs in the shoulder and was carried from the field. Marshall Louis Nicolas Davout, seeing that the attack was in trouble, galloped forward and rallied the French, who successfully stormed the redoubt about 7:30. The second redoubt was stormed and captured about 8:00 a.m. by the leading division of Ney's Third Corps. The French had little time to secure either redoubt before the Russians counterattacked. They were also hampered by the fact that the redoubts were open in the back, which made them vulnerable to Russian cannon and musket fire. A third redoubt, further back, served as a sanctuary and rallying point for a renewed assault. Neverovsky's 27th Division recaptured the southern redoubt. The French would capture all three redoubts, only to lose them to Russian counterattacks. Finally, around 11:30, with the fourth attack, the Bagration redoubts were captured. They remained in French hands for the rest of the day. Russian forces would suffer terrible losses from French canister during their counterattacks. The Russian Regiment Lithuania lost about 956 men in an hour and Prince Bagration would receive an ultimately fatal wound, when his shinbone was shattered by a shell burst. The main French attack against the Rayevsky redoubt would be launched about 10:00 in the morning. Until the attack got under way it was slowed by Russian light infantry deployed below the redoubt. A. J. Charles Bonami's 30th French Line brigade led the assault, reinforced by a heavy artillery barrage. The Russians were low on ammunition and when it finally ran out, the French took the position. Before the French could bring up their own artillery, General Yermolov, First Army's chief of staff, moved three Russian horse batteries behind the redoubt and fired into the French forces inside the fortification. He then led the Ufa Regiment, supported by two arriving Jaeger regiments, in a bayonet attack, which drove the French out. The Russians would lose their artillery chief, General Alexander Kutaïssov, in the counterattack. His horse was seen with an empty blood-covered saddle galloping across the field. French losses were staggering. The 30th Line Regiment, which had begun the attack with 1,300 soldiers, returned to its lines with only 257 men and eleven officers. Bonami himself was captured. Just south of the redoubt the French, after two attacks, had captured the heights of the hamlet of Semenovskoye. There they positioned a battery of eighty guns which began firing on the redoubt and the Russian columns moving toward it. Despite the cannonade Prince Eugene of Wuerttemberg led four regiments of around 3,600 men against a French infantry column as it moved toward the redoubt. The Volhynia and Tobolsk regiments lost several hundred men to the cannonade and the generals Schroeder and Rossy were killed. The French Eugene (Eugene de Beauharnais, viceroy of Italy) would make a second assault on the Rayevsky redoubt around 2:00 p.m., with Broussier's, Morand's, and Gerard's divisions supplying the assault columns. The French cavalry would attack the north and south sides. Before reaching the redoubt the French forces had to deal with bayoneted fusiliers positioned in the surrounding ditches by General Likhachov. General Auguste de Caulaincourt, leading the cavalry attack on the northern side, managed to enter the redoubt, but was shot dead. Successive waves of cavalry were unable to withstand the Russian musketry and their attacks failed. It was only when the three infantry divisions stormed the redoubt that it was taken. With the great redoubt in their hands, the French hoped a cavalry attack against the Russian lines near Borodino might succeed. Two divisions of General Grouchy's Third Cavalry Corps moved up a gully. They were met by the remaining members of the 1st Russian Cuirassier Division, led by General Barclay and, after sharp fighting, were forced to retreat. With the repulse of the cavalry attack, the remaining battle became an artillery duel. Barclay was unwilling to risk any more forces in a counterattack to retake the Rayevsky redoubt. At the same time, Napoleon planned no further attacks against the Russian lines. While Prince Eugene moved the French artillery forward to a line which stretched from the captured redoubt south, he withdrew his infantry behind a hill and ordered them to lie down to avoid the shells coming from the Russian batteries. 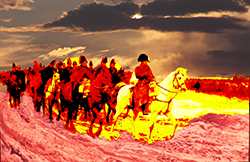 Around 4:00 p.m. Napoleon rode out to inspect the battlefield and the French positions. No orders were given for any renewed attack. The musketry fire would begin to fall off an hour later, with the artillery fire continuing until nightfall. The Poles of General Claparède's Young Guard division were ordered to hold the captured Rayevsky redoubt, while designated units were to hold the other positions captured that day. With these units Napoleon planned to claim mastery of the battlefield. The Grand Army's French, German, Italian, and Spanish regiments were quietly withdrawn to their starting positions during the night. Napoleon had gotten his wish, a decisive battle, but he had failed to decisively win it. At day's end the Russians were still fighting and their lines were unbroken by the French attacks, even if they had been pushed back. General Kutuzov, on learning from Colonel Toll that the Russian Second Army had probably suffered 20,000 casualties and the First Army another 25,000, ordered a withdrawal toward Mozhaisk during the night. 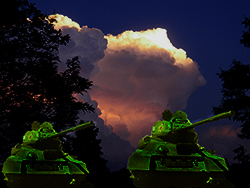 Around 2:00 a.m. the army began moving. Official French losses were set at around 28,000. Included in this figure were forty-nine killed or wounded generals, ten dead colonels, and another twenty-seven wounded, and 6,547 dead officers, noncoms, and soldiers. The figure for wounded, 21,453, suggested that the French had come off comparatively better than the Russians in the battle. However, most of those wounded seriously enough to be left behind would later starve to death. These figures did not include the loss of 15,000 cavalry horses. The cavalry had started the invasion with 70,000. Losses in the fighting leading up to Borodino had reduced the number to 30,000. Coming out of the battle it had only 15,000 horses. The artillery on the French side, had fired 60,000 rounds, while French infantry had fired nearly two million cartridges. The Russians had lost about 52,000, roughly half their line troops. Four generals had been killed and another eighteen wounded. Generals Bagration and Tutshkov I, among the eighteen, would later die of their wounds. Only 1,000 Russians had been taken prisoner. Despite the losses, it did not take the Grand Army long to cover the seventy miles between Borodino and Moscow, since the retreating army chose not to offer any resistance. On September 13th, at a war council, Kutuzov decided that the Russian army would abandon Moscow and retreat to Ryasan. The Russian rear guard, under Miloradovitch, would leave on September 14th, after arranging a truce with the advancing French, who then moved into the city. Napoleon, still believing that Moscow's capture would bring Russia under his control, set up temporary headquarters in Dorogomikov, one of the suburbs, hoping an official delegation would come out to greet him. He had to make do with a deputation of merchants. Before leaving the city, Moscow's governor general, Count Fyodor Rostopchin, had held a secret meeting of police agents and patriotic individuals. Once the French troops had entered the city, it was decided, the fire-fighting barges were to be burned by police agents, disguised as beggars or artisans. The common-law prisoners, numbering around 800, were to be released from prison with the promise of a pardon, if they would start fires in buildings occupied by the French. They were also to be given Congreve fuses, special incendiary devices, to ensure that the fires would take hold. About midday on Monday, September 14th, a fire broke out near the Kremlin and around five that afternoon smoke was seen coming from the area of the Kitai-Gorod bazaar. Two hours later smoke was seen behind the governor's mansion. An explosion inside the palace led to a fire which soon consumed it. After eleven a large explosion rocked the Raouza River area, east of the Kremlin, the site of a munitions depot. The French managed to put most of the fires out on the 15th, when Napoleon made his entrance into the city on a white horse. New fires broke out that night. At four in the morning, on the sixteenth, Napoleon was awakened to find a fire advancing across the city toward the Kremlin. Around 5:30 a.m. he decided it was prudent to evacuate the Kremlin for the safety of the suburbs. A rain, which began falling around three in the morning on Friday, September 18th, and then turned into a downpour during the day, finally quenched the flames. Napoleon returned that day. A month later, on October 18th, he decided that there was no point in remaining in the burnt-out city and his army began leaving Moscow. Napoleon's underlying assumption, that the defeat of Russia depended on the actions of Alexander, was probably correct. If Alexander had been willing to admit that he was beaten by surrendering or negotiating a peace agreement, Russia would have been conquered. It was Napoleon's other two assumptions, that either a decisive battle or the capture of Moscow would be enough to cause Alexander to admit defeat, that proved incorrect. Winning a pitched battle, of course, had depended on a Russian army willing to stand and fight one. At Borodino Napoleon had his wishes fulfilled, at least partially, when the Russian army dug in. Though he had inflicted more serious losses on the Russians, the French had spent an entire day's fighting trying to capture the village of Borodino and the Rayevsky and Bagration redoubts. With the Russian army withdrawing, but still intact, Napoleon's victory, if it could be called that, had not been a decisive one. Perhaps the greater shock to Napoleon was the fact that the Russian loss of Moscow, a far more valuable prize, with a potentially greater psychological impact, had no visible impact on Alexander. Napoleon had written to Alexander when he returned to the Kremlin, following the fire, but received no reply. On October 4th, he sent General Lauritson to Russian headquarters. Kutuzov met with him, but would not discuss terms. While geographical control of a prize such as Moscow, usually was the objective evidence of victory, legitimacy, in Napoleon's eyes, required a written confirmation from the defeated enemy. Alexander had not only forbidden Kutuzov from entering into negotiations, he would not even dignify Napoleon's overtures with a public, or even private, response. Hitler, in 1943, did not share all of Napoleon's illusions. In a war which had turned into a series of battles and in which the Russians continued to fight even while retreating, he was not counting on a single victory to intimidate Stalin. Moscow remained a significant military prize, but Hitler knew that it was likely to take the destruction of the Red Army to achieve victory. At the same time, there had been similarities in thinking which marked both the 1812 and 1941-43 campaigns. Hitler, at the beginning of Operation Barbarossa in June 1941, had a military with a reputation for success in its European operations. Poland, invaded on September 1, 1939, had been conquered in less than a month. Germany's major rival, France, had taken two months to defeat (May - June 1940). The success of the various blitzkrieg campaigns, the high impact "lightning war" had established the norm and suggested that German victory was inevitable in any encounter. Logistically, Hitler was able to supply an army which was vastly larger than Napoleon's Grand Army. Even as the Germans were retreating in 1943 they were able to maintain 168 divisions (3.1 million men) on the Eastern Front, another forty-four divisions in France, and seven divisions in Italy. If the creation of a successful, modern army illustrated a practical side to Hitler's personality, other evidence suggested that he was too much of an optimist and a romantic, particularly with regard to war. He viewed himself as the reincarnation of Frederick the Great. If he understood the technological demands of mechanized warfare, he also had unrealistic expectations about its capabilities. He expected the new Tiger and Panther tanks to rescue the situation on the Eastern Front, but had not undertaken any serious planning to make them available. Germany did not have the industrial capacity to manufacture them in the quantities needed on such short notice. They were still in the development and testing stage when Kursk began. Exhaust or fuel-line problems caused several Panthers to catch fire as they were moving into position before the battle. The Tiger, with its 88mm gun, was the most powerful tank in the world at the time, but too few were being produced. In November 1942, German factories were turning out only twenty-five a month. Fourth Panzer Army, on the eve of Kursk, had only fifty-six Tigers and 104 Panthers, supplemented by forty-five assigned from Heavy Panzer Battalion 503. Hitler, for all the success of the blitzkrieg campaigns, had failed to fully mobilize Germany's war effort. In 1941 war production was still at the 1940 level. At the end of 1942, there still some six million workers producing consumer goods. Although he had been blinded in a gas attack in the First World War, Hitler still romanticized warfare. He promoted the commander of the encircled German Sixth Army at Stalingrad, Friedrich Paulus, to field marshal on January 30, 1943. Since no German field marshal had ever surrendered, Hitler believed that the action would at least shore up German resolve to fight to the death. He was bitterly disappointed when Paulus, along with fifteen generals, surrendered the next day. At the least he should have committed suicide. Hitler was not the only dictator prone to optimism. With the retreating German army in disarray, following Stalingrad's surrender, Stalin expected an all-out offensive by the Red Army to drive the Germans out of Russia. Kursk was in Soviet hands on February 8th, followed by Rostov on February 14th and Kharkov on the 16th. The Germans, if they were falling back before the Russian advance, had not been broken, and were not giving up the fight. 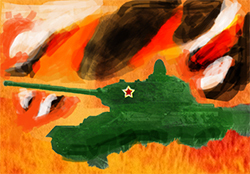 On February 20th their armored forces counterattacked. Lieutenant General Paul Hausser, commanding the II SS Panzer Corps, had been given the order for a counterattack on February 19th. He had infuriated Hitler at Kharkov by disobeying orders to fight to the last man. Instead he had ordered his men to fight their way out of the city. The XLVIII, XL, and I Panzer Corps, and the three divisions of the II SS Panzer Corps attacked the Sixth Army and Popov's 'Front mobile group.' By February 24th the Russian Sixth Army was facing encirclement. On February 28th what was left of Popov's group was eliminated by the 7rh Panzer Division. Four days later Third Tank Army was encircled southwest of Kharkov and the First Guards Army was retreating to the Donets. Six tank corps, five rifle divisions, and six independent brigades had been destroyed or roughed up. Russian losses were 23,000 killed, 9,000 prisoners captured, and 615 tanks captured or destroyed. Manstein, with a 120-mile gap in the Red lines, now concentrated on retaking Kharkov. On March 15th, the Germans ended Russian resistance in the tractor factory and the city was in their hands. They then retook Belgorod. By failing to quickly follow up with an attack against Kursk however, they allowed the Russians to stabilize their retreating line there, and thus lost a chance to continue the advance. Although the Russians had been stopped temporarily, the German high command was unsure of its next move. Manstein thought they should either wait for the next Russian attack and then counterattack, or mount a major 'pincer' attack themselves against the Kursk salient with the goal of trapping the Russian forces inside. He doubted that the German army, with its recent losses, had the capability to mount a major offensive. His thinking was that the only real hope lay, not in a major victory, but in a war of attrition. It still seemed feasible to wear the Russians down to the point where they would accept a stalemate. On April 11th, Colonel-General Kurt Zeitzler submitted a memorandum to Hitler suggesting an attack against the Kursk salient. On April 15th Hitler signed Operational Order No. 6, the plan for Operation Zitadelle (Citadel). Stalingrad had shaken his self-confidence and the issuance of the order suggested that he had begun to recover. Yet, the order itself contained conflicting messages. On the one hand it used mythical language which reflected Hitler's idealized view of war. "The victory of Kursk must be a beacon to the world." The German attacks were to be 'merciless,' and the enemy was to be 'annihilated.' A concentration of forces would allow the Germans to break through the enemy 'in one blow and destroy him in a cauldron battle.' On the other hand, it contained detailed instructions about troop dispositions and the basic objective of encirclement. Heinz Guderian, at the time Inspector-General of Armored Troops, confronted Hitler almost directly on the assumption that victory would boost morale by serving as a 'beacon to the world.' 'How many people do you think even know where Kursk is?' he asked. Guderian's view was that, whatever resources were committed would not yield corresponding gains. There were other more important areas to concentrate on. While the language of Order No. 6 may have suggested a leader out of touch with reality, there were reasons why even a psychological boost from a victory in an unknown location would be important. The Axis forces had been beaten in Africa, and would surrender on May 13th. Hitler was concerned that allies, such as Mussolini, would withdraw as a consequence of the defeat. There were also fears of an Allied landing in Greece or Italy. If events in the Mediterranean demanded a spectacular victory to shore up flagging morale, they also distracted Hitler and fed on his doubts. He kept postponing the Kursk offensive. The earliest date for beginning the offensive had been tentatively set at May 3rd in Order No. 6. Walter Model, commander of Ninth Army, became alarmed by evidence of a buildup of Soviet defenses around Kursk. Hitler moved the date back to May 5th, rethought that decision, and postponed it again, to May 9th. On May 4th Hitler moved the date further back, to mid-June. Only on June 21st did he set what was to be the final date, July 5th. On July 1st Hitler, meeting with his senior commanders at Rastenburg, gave the final go ahead for Citadel. The next day Stalin received the details of the conference and sent a message to his commanders at Kursk to expect an attack between July 3rd and July 6th. Information available to the Russians about the last-minute details of Citadel were not the result of an unexpected or accidental coup. They had been informed of German intentions almost from the moment Hitler issued Order No. 6 in April. British Ultra intelligence, the decrypted messages of Germany's Enigma cipher system, had been passed on to Moscow through agents in Switzerland. The British had been given one of the typewriter-like Enigma machines in August 1939. Breaking the code had allowed the British to warn Stalin, on June 12, 1941, that Germany would launch Operation Barbarossa on June 22nd, a warning he ignored. The Soviet Union had two sources of information in Switzerland. One was Alexander Foote, second-in-command of the Soviet spy network in Switzerland. The other was Lucy, a codename for Rudolf Rössler, a German expatriate living in Lucerne. Both were receiving Ultra information which they forwarded to Moscow. While Lucy could not prevent a last-minute change of plans, it nevertheless reinforced Russian ideas about the need to prepare a strong defensive line at Kursk. They also received confirmation of German plans on the eve of battle. A downed He111 pilot told them that additional Luftwaffe formations had been moved up from the Crimea. A Slovene sapper, deserting from the German lines on July 4th indicated that the offensive would begin on July 5th at three in the morning, a date and time confirmed by a captured German sapper. Stalin, whether he had ignored warnings about the German invasion in 1941 and been caught unprepared, or had been trying to avoid an overt provocation, found a ready scapegoat for battlefield losses in General Armii D. G. Pavlov. Pavlov was recalled to Moscow at the end of June, where, along with his chief of staff and deputy for political affairs, he was court-martialed and shot. In 1943, Stalin took the retreat and destruction of Sixth Army and Popov's 'Front Mobile Group,' along with the loss of Kharkov and Belgorod in stride, comparatively. He had not given up on the idea of an all-out offensive. However, Zhukov, Vasilevsky, and Antonov in May were finally able to persuade him to postpone the campaign until after the expected German attack against the Kursk salient had been repulsed. In trying to gauge German intentions, Stalin was not relying entirely on information supplied by Lucy. 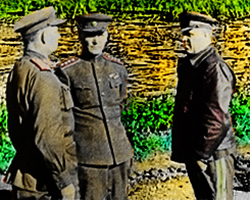 He sent Zhukov on an inspection of the Kursk positions toward the end of March 1943. On April 8th Zhukov delivered his report. In his assessment, German losses during the winter made it unlikely that their army could mount a major campaign. Instead a more limited offensive could be expected, and with the current dispositions, any attack was likely to come in the Central, Voronezh, and South-Western fronts, particularly around the Kursk salient. German losses among the infantry also made it likely that any attack would rely heavily on armored and air units. Zhukov ended his report by advising that a defensive operation would serve to wear down the German army, which would allow fresh Red reserves to mount a general offensive campaign. Stalin, neutralized, if not totally convinced, allowed the army to prepare for a defensive action in earnest. By July, when the Nazi forces began their attack, the Russian defensive positions in the salient consisted of eight echeloned defensive lines, to a depth of 100 miles. The construction had been completed with the help of the civilian population, which provided 105,000 workers in April. The number would be increased to 300,000 soon after. There were three main defensive lines, although the first two, the 'main' and 'second-line' had a depth of ten miles, behind which was the 'army defensive field.' There were an additional three defensive lines called 'Front positions' which added additional depth. Finally, there were two rear lines behind the other six. The heaviest fortifications included underground bunkers, which provided substantial protection from the German artillery bombardments. In all, the Soviets had managed to construct more than 6,000 miles of trench works. The area in front of the lines contained wire obstacles, mines, and anti-tank ditches. Over a million anti-personnel and anti-tank mines were laid, with an average density of 2,400 anti-tank and 2,700 anti-personnel mines per mile of front. As a systematic defense against a massed armored attack the Germans had created the Pakfront, a battery of up to ten anti-tank guns, which concentrated its fire on a single target. The Soviets used similar groups of 'anti-tank resistant points' (protivotankovye opornye punkty, or PTOPs), which were situated around the battlefield. Each normally contained five 76mm anti-tank guns with five anti-tank rifles, along with sappers and a squad of sub-machine-gunners. On the Central and Voronezh Fronts, the Red Army had assigned ninety-two artillery regiments with a combined gun and mortar strength of 20,000, of which 6,000 were anti-tank guns. By the time Citadel began in July, the advantages offered by armor - speed and the protection of inches of armor plating - if not eliminated, had been neutralized or seriously reduced. Blitzkrieg warfare depended, not just on the concentration of force, but on its quick success and rapid advancement. The Red Army, with its defensive preparations, guaranteed that any advance would be painful and slow. The primitive nature of the Russian road system alone had been enough of a hindrance in 1941 to frustrate the blitzkrieg campaign which had proved so successful in Europe, according to General Mellenthin. The Russian weather compounded matters. The fall rains and spring thaw created the 'rasputitsy,' or "times without roads." 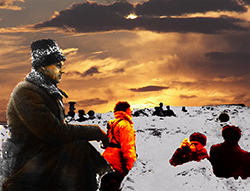 On October 6, 1941, the first snow fell on the advancing German lines. The alternating snow and rain which followed turned the roads to mud. The wider-tracked Russian T-34 tanks proved more maneuverable in the mud than the German armor and were able to slow the advancing columns. Although Army Group Center was within thirty-five miles of Moscow at the end of October, its advance had stalled. Freezing temperatures signaled the end of the rasputitsa and allowed the Germans to resume their advance by the second week in November. On November 28th, the 2nd Panzer Division of the Fourth Panzer Group had come within twelve miles of Moscow. Yet German forces found their progress slowed by the minefields and earthworks surrounding the city and the determined defense of Soviet Fiftieth Army. Russian counterattacks, seemingly ineffective, were nevertheless taking a toll on the German attackers. On November 28th, General Mackensen, commander of III Panzer Corps at Rostov, was ordered to withdraw from the city, which had only been taken on the 21st. Stalin had been scrambling to put together new reserve units and, on November 29th, two of the newest, the First Shock and Twentieth Army, made contact with the Third and Fourth Panzer Groups at Yakhroma and Krasnaya Polyana. The German Fourth Army's 258th Infantry Division managed to break through the Soviet line south of the Moscow-Smolensk highway on December 1st and Second Panzer Army made some gains near Tula on the 2nd. On the 3rd however, the 258th Infantry Division found itself in danger of being encircled. The 4th brought temperatures of -4 degrees F. and renewed attacks against Third Panzer Group. That night temperatures dropped even further, to -25 degrees F. On the morning of the 5th the Germans found that their tanks would not start. Just as ominously, the lubricants and oil in the recoil mechanisms of their machine guns and artillery had congealed and they would not fire. On the morning of December 5th, an attack across the ice-covered Volga by the Soviet Twenty-ninth Army penetrated a mile into the Ninth Army positions before being stopped. The attack was a preliminary to the counter-offensive, which had been officially set for December 5th and 6th. On the 6th the temperature had dropped to -38 degrees F. The initial attacks were somewhat disorganized, although the Thirtieth Army advanced eight miles against the Third Panzer Group. German commanders were advised to begin pulling back during the night. Sunday, December 7th, found German trucks and wagons trying to drive west through drifting and blowing snow. Third Panzer Group abandoned fifteen tanks and three heavy howitzers. Troops found it impossible to tow guns out of their emplacements. Motors would not start, and the grease on bearings and in transmissions of those vehicles which were running froze. Army Group North was nearly encircled as the Soviet counter-attack gained momentum. When the first phase of the counter-offensive ended on December 16th, the Germans had been pushed back thirty miles on their northern flank and more than fifty in the south. Whether Hitler was having second thoughts about the value of the blitzkrieg concept or was simply trying to prepare the German public for a longer than expected campaign in Russia, he begun to express doubts about it publicly. In a speech given in Munich on November 8, 1941, the anniversary of the 1923 Beer Hall Putsch, Hitler called 'blitzkrieg' an "idiotic word." He would fight the war to the "last battalion." He would continue it beyond 1942, if necessary. The economic advantage of blitzkrieg was that it was a cheap method of waging war, given the relative swiftness with which it was concluded. Even in Russia, it had worked quite well in the early stages of Barbarossa, judging by the number of prisoners captured and the rapid territorial gains made. By June 29th, six days after the invasion began, Second and Third Panzer Groups and Fourth and Ninth Armies had encircled two Soviet pockets near Bialystok and Minsk that would yield 300,000 prisoners. The Smolensk pocket, eliminated on August 5th, would yield another 300,000 prisoners, as well as 3,000 tanks, either captured or destroyed. The pocket north of Kiev, closed by the first week in September, would yield 665,000 prisoners. The Russian blitzkrieg campaign, despite its early gains, had not been swift and, in human terms, had not been cheap. The German army had suffered casualties of 686,000 by November 1st. The fact that the terrain was relatively flat, and therefore offered few natural defenses against an armored attack, in some ways, made Russia a seemingly ideal candidate for blitzkrieg. At the same time, the success of blitzkrieg, if it relied on overwhelming force, was also dependent on finding the weakest part of an enemy's defenses, where the force would have the greatest impact. In France, German armor had found a way around the Maginot line through the Ardennes Forest. While thicker armor could protect crews from larger and larger shells, and heavier armament could increase offensive power, on the attack, the tank arm of the blitzkrieg was most effective against relatively weaker positions, whether they were other tanks or unprotected infantry units. For Hitler, with his grandiose plans, the tank almost came to embody the blitzkrieg. Battlefield success, in his eyes, depended on having the largest, best protected tanks. Yet, the blitzkrieg, as an overall concept, depended on more than just heavy armament. As the Germans discovered in December 1941, an armored attack depended as much on mobility as on armor. Tanks which would not start in cold weather were as effectively stopped as those destroyed by an armor-piercing shell. The Russian T-34s, if not as powerful as some of the German tanks, contained a compressed air starter which could turn the engine over even in the coldest weather. Their broad tracks allowed them to handle better in the snow. It was also not necessary to attack a tank directly in order to neutralize it. Cutting its fuel supply was just as effective. Tanks which had not been immobilized by the cold had to be abandoned by the Germans because they had run out of fuel. The snow-clogged roads limited the amount of fuel which could be transported in optimum conditions, but Russian attacks on supply columns created conditions which were less than favorable. 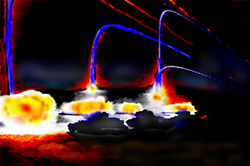 Attacking a fuel convoy miles to the rear of the front lines was much safer than a frontal assault, and just as effective at eliminating the tank threat. Tanks were vulnerable in other movement-related ways. Their treads were vulnerable to mines and the more they weighed the more difficult they could be to move once stuck or disabled. The battlefield at Kursk was full of mines and ditches which tanks could fall into. If Russia's flat landscape offered few obstacles to a motorized advance, the soil itself served as an effective substitute for armor, if ditches or trenches could be dug deep enough. Hitler's basic plan at Kursk, sending mobile armor against dug-in positions, was clearly at odds with one of the basic theories of blitzkrieg, using overwhelming force to overcome a weak point. A slugging match between two heavily armed opponents may have seemed the ideal demonstration of armored power in Hitler's idealized world or war. It did not represent the most effective use of the tank's capabilities. German preparations, even with the technological expertise on which German engineers and designers prided themselves, had been based on experience. In the early phases of the war, that experience was with a mild climate, unchallenging terrain, and easy victories. Hitler seemingly had been lulled into a sense of complacency. Russia was clearly not prepared for the German onslaught, as the early victories of Operation Barbarossa had demonstrated. At the same time, Russia had been laying the groundwork for an extended campaign. Germany had begun budgeting early for conflict. She had invested the equivalent of $8.6 billion between 1935 and 1938 while the Soviet Union had only spent $4.7 billion. In 1939, however Stalin invested $3.3 billion, nearly as much as Germany's $3.4 billion. Germany was still ahead in 1940 expenditures, $6.0 billion to the Soviet Union's $5.0 billion, but in 1941 the Soviet Union had increased its budget to $8.5 billion, while Germany remained about the same, at $6.0 billion. Germany also was up against a significant population advantage enjoyed by the Russians. The population of Germany was 89 million people, while the Soviet Union's population was around 193 million. The Soviet Union had also been extremely lucky, in moving its heavy industry far enough eastward in time to escape the advancing German armies. The new locations east of the Urals placed the factories out of range of German bombers. In 1937 the Soviet Union had 15,000 tanks, with Soviet factories turning out over 3,000 tanks per year. Production of the T-34 would not start until 1940, with only 1,225 produced by June of 1941. During 1941 a total of 3,000 T-34s would be produced, increased to around 6,000 in 1942. Total tank production in 1942 reached 24,446. Just before Kursk, in April 1943, Soviet factories were producing around 1,000 T-34s a month. In 1944 tank production would reach 2,500 a month. As of June 1941 there were 67,335 artillery pieces and mortars. The Soviet air force had a total of 17, 745 planes, but of this figure, only 2,739 were newer models, such as the MIG-3, YAK-1, LAGG fighters, and the IL-2 (Shturmovik). In 1942, 22,681 aircraft were produced. The fighting strength of the Russian army kept increasing, despite Hitler's expectations, in March 1943, that it would run out of manpower 'sooner or later.' Front-line troop strength in June 1941 had been 2.9 million men. It reached 4.2 million in December. In June 1942 it was 5.5 million. By November 1942 it had reached 6.5 million. The Russians, as if to compensate, did have a tendency to throw their forces away. 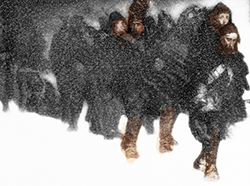 If it were not unarmed 'tramplers,' sent out to trample down the snow in front of German positions in preparation for an attack, it was the punishment battalions of deserters or civilians marched at gunpoint through minefields as a means of clearing them. The German army which began Barbarossa numbered 3,050,000 men. The army and SS, by February 1943, had lost over one million dead and missing in the Russian campaign. The German force which began Barbarossa in June 1941 had 3,350 tanks, 7,184 artillery pieces, and 600,000 motor vehicles. By November a third of the vehicles had been worn out or damaged beyond repair. Panzer divisions had lost 65 percent of their tanks. Compared to the Soviet output of 24,446 tanks in 1942, the Germans only produced 5,958 tanks. The Tiger, with an 88 mm converted antiaircraft gun, was only being produced at the rate of twenty-five a month in 1943. The Panther, heavier than the T-34 (49 versus 32 tons) and faster (34 versus 32 mph), was being produced twice as fast as the Tiger, but, at fifty per month, was far below the 1,000 a month achieved by Russian industry. German aircraft production in 1942 was 15,456. Around 2:45 on the afternoon of July 4, 1943 a ten-minute bombing attack began near Butovo. Around 150 dive bombers of Luftflotte 4 concentrated on a two mile front. When they were through German artillery and rockets continued to pound the Russian lines. The barrage allowed the infantry of XLVIII Panzer Corps to push forward, following the taped paths cleared through the minefields the night before by sappers. Despite a severe thunderstorm, the heights of Butavo were in German hands by 4:45 in the afternoon. Resistance proved stronger at Gertsovka, to the west, which was not taken until midnight. 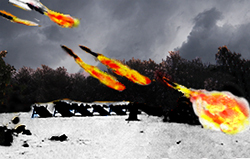 To the east, at Streletskoye, II SS Panzer Corps used flamethrowers to take the trenches. The Russians replied around 10:30, using the 600 guns and mortars of 6th and 7th Guards, in a kontrpodgotovka, or disruptive, attack. The preliminaries had taken place near Belgorad, the southern "pincer" of the Kursk salient. The German plan for Citadel involved closing the pincers around the Kursk salient with an attack by Ninth Army on the north and by Fourth Panzer Army on the south, with the intention of meeting east of Kursk. The offensive was a joint operation, requiring the cooperation of Army Group Center's commander Field Marshal Hans Günther von Kluge and Army Group South's Field Marshal Erich von Manstein. General Walter Model commanded Ninth Army of Army Group Center. Colonel General Hermann Hoth commanded the Fourth Panzer Army, of Army Group South. The Soviet force facing Model was Central Front, commanded by General Konstantin K. Rokossovsky. Because of his unpredictable independence, Zhukov had been sent to Central Front headquarters to coordinate overall operations. Facing Fourth Panzer Army, in the south, was Voronezh Front, commanded by Nikolai Vatutin. Stalin had also assembled a reserve army, some 100 miles southeast of Kursk, called the Steppe Military District, under the command of General Ivan S. Konev. The German forces at Kursk totaled 570,000 men, nearly 2,500 tanks and self-propelled guns, and about 10,000 field guns and mortars, along a front of 250 miles. Russian forces were 977,000 men, 3,300 tanks and assault guns, and 20,000 guns and mortars. The Germans had 2,000 aircraft against a Russian air force of 3,000 planes. The Russians, from the information given by the captured German sapper, expected the main attack at 3:00 a.m. on the morning of July 5th. An artillery bombardment was planned to start a half hour before the attack, at 2:30. While the Russians were not preparing an infantry or tank assault on the German lines, General Rokossovsky decided to preempt the Germans with a Russian artillery barrage by 13th Army, which, opened up at 2:20. Around 3:20 a.m. a second Soviet bombardment of 1,000 guns came from Vatutin's 6th Guards units. The German infantry were still in their trenches and suffered relatively light casualties. The bombardments, apart from their psychological impact, served mainly to disrupt the timetable. There was some return fire from German batteries, however the main German artillery bombardment did not start until 4:30 a.m. against Central Front. The German formation Manstein was about to use was the armored wedge, led by the heavy Tigers. Behind would come hundreds of Panthers and Mark IVs, infantry with automatic weapons and then mortar crews in armored carriers. The wedges would be organized in overlapping units. Model's northern Ninth Army had fourteen infantry divisions, six panzer divisions, and one panzer grenadier division. Hoth had eleven infantry divisions, six armored divisions, and five panzer grenadier divisions, along a front only thirty miles wide. Model's attack, on the northern front, on July 5th would advance six miles, taking the towns of Bobrik and Butyrki. It would gain another six miles on July 6th, but was still a mile short of the town of Olkhovatka. The fighting on that day had resulted in 25,000 German casualties and the loss of 200 tanks and self-propelled guns. Despite four more days of heavy fighting, it would make no further gains. The Germans would take the village of Ponyri, but the Red Army would maintain its positions to the south. The last German attack there came on the night of July 10th, but it was pushed back by Russian counterattacks. The Russians, on the 12th, were down to their last major defensive lines, but Model's advance had been stopped with Kursk only forty miles away, to the south. Model's ability to control events in his sector after July 12th was lost to developments further north. The Russians of the Bryansk and Western Fronts began attacking units of the Second Panzer Army holding the Orel Bulge. Model was forced to divert Panzer and motorized units from his attack to help Second Panzer. Hoth's advance, to the south, was planned as a direct route from his starting point north through Oboyan, which was about halfway to Kursk. Seeking to go around Katukov's First Tank Army, Hoth only made a feint at Oboyan. On July 9th, having reached the Psyol River, twelve miles from Oboyan, the 48th Panzer Corps wheeled southeast toward Prokhorovka. The II SS Panzer Corps had reached Prokhorovka by July 11th and was preparing for a renewed assault on July 12th. The Steppe Front's Fifth Guards Tank, under Lieutenant General Pavel A. Rotmistrov, had also arrived on July 11th, with 850 tanks. On the 12th his tanks advanced against the 600 tanks of Hausser's SS panzer corps in a three-mile square between the Psel and the railway embankment at Belenichino. The Germans and Russians would each lose about 300 tanks, including 70 Tigers on the German side. When the Russians withdrew to regroup, the II SS Panzer Corps was in possession of the field. The Germans were unable to advance further however. They would continue attacking on the 13th, 14th, and 15th, but would be unable to push beyond Prokhorovka. On July 17th, Army Group South was facing renewed Russian attacks to the south. The First Panzer Army was attacked south of Izyum by Malinovsky's South-Western Front. Hitler would order II SS Panzer Corps withdrawn and XXIV Panzer Corps was moved south to reinforce First Panzer Division. Although fighting would continue, Hoth's forces were back at their starting point by July 23rd. The German attack on July 5th, began at 5:30 a.m., following a twenty-minute bombing attack, along a thirty-mile front. Slowed by anti-tank mines, the first attack faltered and then retreated to its starting point. Beginning at 7:30 the Germans bombarded the Russian lines for an hour, then attempted another advance. Bobrik was taken about 9:30 by 20th Panzer. The 86th Division of XLI Panzer Corps reached the third line of Russian trenches and 184th Grenadier Regiment fought to the outskirts of Ponyri. The July 5th fighting had taken a heavy toll in tanks and self-propelled guns. Some 100 had been lost to mines. In addition, many of the Tigers and Elefants had become stranded far beyond the infantry. The infantry, in trying to reach the stranded vehicles, found itself under mortar and machine-gun fire from Russian units which had allowed the Tigers to advance past their positions. They then opened fire on the infantry following behind. The Elefants, which carried no secondary (machine-gun) armament, were vulnerable to attacks by flame-throwers. On July 6th Heavy Panzer Battalion 505 took Soborovka. The village of Samodurovka was taken by 20th Panzer Division on July 8th. The 4th Panzer Division then moved south against Teploye and Hill 272. After three days of fighting the Germans had taken Hill 272 three times and had been forced to give it up in the face of Soviet counterattacks. Hill 253.5, near Ponyri, would remain in the hands of 1032nd Rifle Regiment, despite repeated German attacks. The stubbornness of Soviet ground forces had been matched by the aggressiveness of the Sixteenth Air Army. In one attack the claim was that they knocked out seventy of 9th Panzer's tanks using the 37 mm cannon of their Il-2m3 Shturmoviks. On July 12th, with the town of Olkhovatka still in Russian hands, the Soviet Army launched Operation Kutuzov against the Orel salient. The Russians had 1,286,000 men against a German force of less than 600,000. The Russians also had 2,440 tanks and self-propelled vehicles. On July 15th Pukhov's 13th Army attacked into the Orel salient toward Kroma. Model, forced to deal with the Soviet attacks on the Orel salient, was unable to continue the advance toward Kursk. Hoth expected to open the July 5th assault with an air attack on Russian positions. The Luftwaffe had 800 planes preparing for take-off at the airfields around Kharkov early in the morning. The Soviet Seventeenth Air Army, in the air with 450 planes, was hoping to catch most of them on the ground. The German radar picked up the approaching planes just in time to scramble the fighters. By the time the Russians arrived over the airfields, most of the planes had taken off and the German fighters shot down 120 Soviet planes, against German losses of sixty planes. A heavy aerial attack by German bombers hit the Russian positions to the front of Hoth's armor, which began its attack at 5:00 in the morning. 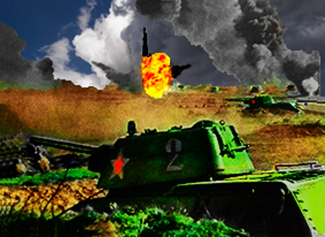 A combination of mud, minefields, and Soviet air attacks slowed the attack. Grossdeutschland was held up for two days by a swollen stream and swampy ground, while Soviet fighter-bombers destroyed a number of tanks. During the morning the advance penetrated five miles, almost to Cherkasskoye, but thirty-six tanks were stuck in the minefields in front of the village by afternoon. The 11th Panzer would take it by the end of the day. Das Reich and Totenkopf had advanced the furthest, twelve miles, by day's end, to the Belgorod-Oboyan highway. Fourth Panzer had lost nineteen tanks on the 5th, less than the thirty-two lost the day before. They had done better in the air, with the destruction of 432 Soviet aircraft, however a shortage of fuel supplies was beginning to limit the number of aircraft the Luftwaffe could keep in the air. The Fifth Guards Tank Army of Steppe Front was 200 miles away from the fighting, but Stalin decided the possibility of a German breakthrough was likely and agreed to send them forward. Rotmistrov began the move at 1:30 a.m. on July 7th. While the Germans seemed to make steady gains, they were troubled by new troops which Vatutin sent in to counterattack or to threaten with flanking movements. Grossdeutschland finally took Hill 260.8, the objective on the road to Oboyan, on July 8th. However, Height 243.0, held by a force of Russian tanks, could not be taken. The battle-group to the right of Grossdeutschland would beat back seven Russian armored attacks. Hill 243.0 and 247.0 would be taken on July 10th. 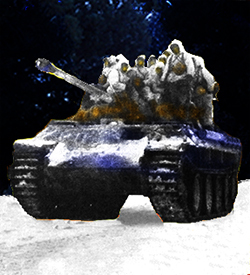 With the Russian infantry and armor seemingly destroyed, the 3rd Panzer Division was ordered to relieve Grossdeutschland on the night of July 11th. As the last units were leaving, the area came under heavy shelling. 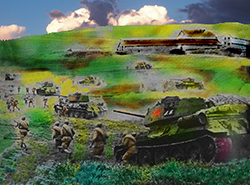 A Russian counterattack followed against 3rd Panzer, pushing it back from its forward positions on Hill 243.0. On July 13th the Russians would re-take Hill 247.0. German counterattacks would re-take Hills 243 and 247 on July 14th. On the night of July 11th, Rotmistrov's Fifth Guards Tank Army, with 850 tanks, mostly T-34s, except for thirty-five British A22 Churchills, arrived at Prokhorovka. On the following morning it would confront about 600 tanks of Hausser's SS panzer corps. The battle, on the 12th, began in the air, around 6:30 in the morning. Stukas attacked the Russian positions, but were driven off by planes of Second Air Army. Russian artillery opened up, around 8:30. The German and Russian tanks then drove into the open space between the Psyol (Psel) River and the railway embankment at Belenichino. The heavier Tigers lost the advantage of their long-range guns once the T-34s were able to drive through their ranks. The Panthers and Mark IVs behind the Tigers were more vulnerable. When guns could not be brought to bear, tanks were rammed into enemy tanks. The battle lasted until around 9:00 that evening. Losses on both sides were said to have been over 300 tanks. 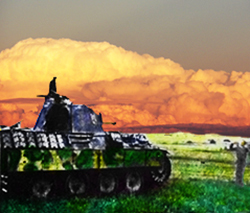 The 3rd Panzer Corps arrived at Prokhorovka on the 13th, too late to participate in the battle. On July 14th Totenkopf was forced back across the Psyol, although Das Reich managed to take the village of Belenichino. The inability to consolidate forward positions prevented further advances. The strength of Russian counterattacks and the failure to eliminate forces on the flanks or in the rear made any advance risky. Hitler, unsure about Citadel from the start, had begun to worry about other fronts. On July 10th, the Allies had invaded Sicily. Kluge and Manstein met with Hitler at Rastenburg on July 13th. Whether he actually called off Citadel on that date, he did discuss the impact of the invasion on Eastern Front operations and the possibility that forces might need to be moved to Italy or the Balkans. It was the Soviet attacks on the 17th that brought Citadel to an end, when German forces had to be withdrawn from around Prokhorovka to reinforce other fronts. On the 23rd, forces in the south were back to where they had started on July 5th. Dale M. Brown, ed., "The Epic of Flight: The Luftwaffe," Time-Life Books, Inc., (Alexandria, VA 1982). Martin Caidin, "The Tigers Are Burning," Hawthorne Books, Inc., (New York, NY 1974). Curtis Cate, "The War of the Two Emperors: The Duel Between Napoleon and Alexander: Russia, 1812," Random House, (New York, NY 1985). Armand de Caulaincourt, "At Napoleon's Side In Russia: The Classic Eyewitness Account: The Memoirs of General de Caulaincourt, Duke of Vicenza," Enigma Books, (New York, NY 2003). Peter Chamberlain and Hilary Doyle, "Encyclopedia of German Tanks of World War Two," Arms & Armour, (London 2000). George Constable, ed., "The Third Reich: Lightning War," Time-Life Books, Inc., (New York, NY 1989). Robin Cross, "Citadel: The Battle of Kursk," Sarpedon, (New York, NY 1993). Tom Donnelly and Sean Naylor, "Clash of Chariots: The Great Tank Battles," Berkley Books, (New York, NY 1996). Roger Edwards, "Panzer: A Revolution in Warfare, 1939-1945," Arms and Armour Press, (London, UK 1989). John Erickson, "The Road to Berlin: Stalin's War With Germany: Volume Two," Yale University Press, (New Haven, CT 1999). John Erickson, "The Road to Stalingrad: Stalin's War With Germany: Volume One," Yale University Press, (New Haven, CT 1999). George Forty, "Tank Warfare in the Second World War: An Oral History," Constable and Company Ltd., (London, UK 1998). Bryan I. Fugate, "Operation Barbarossa: Strategy and Tactics on the Eastern Front, 1941," Presidio Press, (New Haven, CT 1984). General Heinz Guderian, "Panzer Leader," Da Capo Press, (New York, NY 1996). Joel S. A. Hayward, "Stopped at Stalingrad: The Luftwaffe and Hitler's Defeat in the East, 1942-1943," University Press of Kansas, (Lawrence, KS 1998). Ian V. Hogg, "The Greenhill Armoured Fighting Vehicles Data Book," Greenhill Books, (London, UK 2000). Kenneth Macksey, "Tank Versus Tank: The Illustrated Story of Armored Battlefield Conflict in the Twentieth Century," Salem House Publishers, (Topsfield, MA 1988). Major-General F.S. von Mellenthin, "Panzer Battles: A Study of the Employment of Armour in the Second World War," Futura Publications Limited, (London 1979). Brian Moynahan, "Claws of the Bear: The History of the Red Army from the Revolution to the Present," Houghton Mifflin Company, (Boston, MA 1989). Constantine Pleshakov, "Stalin's Folly: The Tragic First Ten Days of World War II on the Eastern Front," Houghton Mifflin Company, (Boston, New York, 2005). Geoffrey Regan, "The Guinness Book of Decisive Battles," Canopy Books, (New York, NY 1992). Richard K. Riehn, "1812: Napoleon's Russian Campaign," McGraw-Hill Publishing Company, (New York, NY 1990). Desmond Seward, "Napoleon and Hitler: A Comparative Biography," Viking, (New York, NY 1988). Stephen Walsh, "Stalingrad 1942 - 1943: The Infernal Cauldron," Thomas Dunne Books, St. Martin's Press, (New York, NY 2000). Adam Zamoyski, "Moscow 1812: Napoleon's Fatal March," Harper Collins Publishers, (New York, NY 2004). Earl F. Ziemke and Magna E. Bauer, "Army Historical Series: Moscow to Stalingrad: Decision in the East," Center of Military History, United States Army, (Washington, DC 1987).